A Victorian Prie Dieu chair. Lovely original rosewood legs and castors. 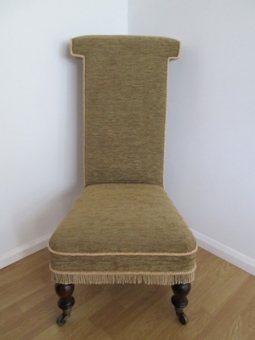 Newly reupholstered with horse and hog hair and coconut fibre plus cotton felt – covering fabric is a golden green velvet with a contrasting gold, hand sewn cord – ready to show and use. Dimensions – depth 56 cms, width 51 cms, height 100 cms.